Born in the upstairs of a cocktail bar, Shut The Front Door has become one of the most talked about parties in Nottingham after selling out consecutive events with their unique tropical lineups featuring an array of Nottingham debuts. 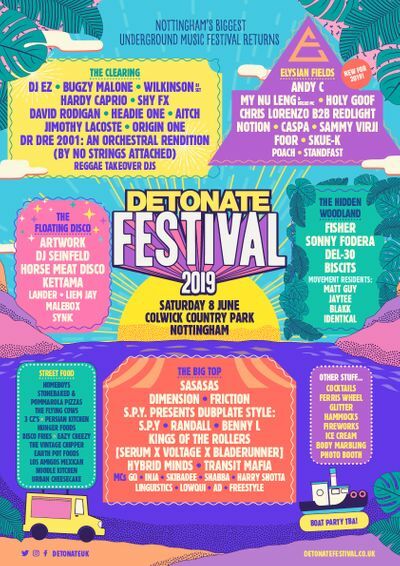 Now operating a residency in North London,the STFD boys are heading back to where it all began for Detonate Festival, where they will be taking over the Roof Terrace Stage with help from Grum on headline duties, supported by STFD DJs. Foamo was a favourite of ours for a while so when he teamed up with Rack 'n' Ruin to form Gorgon City, we were quite excited! I remember first playing one of their first releases on Black Butter, 'The Truth', a couple of years back and people were going crazy so it's good to see they're still having that affect on people with their chart success. Bonobo is a must see for us at Detonate Festival, we're really excited for his set! I mean, what is there not to love about his music? It's chilled, groovy and full of soul. It was the earlier productions SecondCity was putting out in collaboration with Route 94 that got him on our radar. Between them they sampled Destinys Child - Bills and Adina Howard - Freak, to create some house anthems. Now he's sampled Toni Braxton in another house anthem and boy does it get you moving! You wont hear much music by Boddika at an STFD event but if you ever come to one of our secret after parties then expect to hear a lot of his music. We're huge fans and take whatever opportunity we get to go and see him. So we're looking forward to getting stuck in during his set at Detonate Festival. We've been waiting for the perfect opportunity to welcome Grum onto the STFD wall of fame and this couldn't have been a better opportunity to do so. Headlining our Roof Terrace Stage, Grum's production style is a combination of electro, house and techno creating a perfect summer vibe for a roof terrace party. Fresh from the BBC Radio 1 Essential Mix duties, we are very excited to welcome him to the STFD Roof Terrace and he sure wont disappoint!